A sacred place for Jews, Arabs and Christians, Hebron is also at the center of the Israeli-Palestinian conflict. Around 800 orthodox Jews live surrounded by 120,000 Palestinians in the historic center of the city, protected by Israeli soldiers positioned on rooftops. 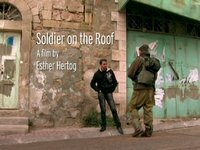 Esther Hertog lived among them for three years, filming their lives and daily struggles for control of the territory - the real, and more often surreal, scenes from a difficult cohabitation. For a full programme of the Middle East Now Festival click here.